Diffraction patterns in quantum physics evidence the fact that the behavior of matter is the result of its entanglements with measurement, or as Karen Barad suggests, the entanglement of matter and meaning. In this sense, therefore, phenomena (including texts, cultural agents, or life forms) are the results of their relational, onto-epistemological entanglements and not individual entities that separately pre-exist their joint becoming. As such, ‘diffraction’ proposes a new understanding of difference: no longer a dualist understanding, but one going beyond binaries. Diffraction is about patterns, constellations, relationalities. From this angle, the book explores ‘diffraction’, which has begun to impact critical theories and humanities debates, especially via (new) materialist feminisms, STS and quantum thought, but is often used without further reflection upon its implications or potentials. Doing just that, the book also pursues new routes for the onto-epistemological and ethical challenges that arise from our experience of the world as relational and radically immanent; because if we start from the ideas of immanence and entanglement, our conceptions of self and other, culture and nature, cultural and sexual difference, our epistemological procedures and disciplinary boundaries have to be rethought and adjusted. 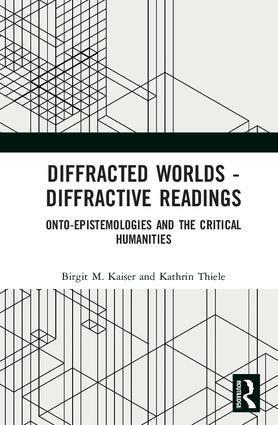 The book offers an in-depth consideration of ‘diffraction’ as a quantum understanding of difference and as a new critical reading method. It reflects on its import in humanities debates and thereby also on some of the most inspiring work recently done at the crossroads of science studies, feminist studies and the critical humanities. This book was originally published as a special issue of Parallax. Birgit Mara Kaiser is Associate Professor of Comparative Literature and Transcultural Aesthetics at Utrecht University, The Netherlands. Her research interests include aesthetics and affect, Deleuzian literary criticism, Derrida, Cixous, and Guattari, as well as literature in postcolonial and transnational contexts. Kathrin Thiele is Associate Professor of Gender Studies in the Department of Media and Culture Studies at Utrecht University, The Netherlands, where she teaches courses in contemporary feminist theories, philosophies of difference, queer theory and feminist technoscience studies. Her research expertise lies in feminist and continental philosophies, theories of difference(s), and posthuman(ist) studies.